Thursday, May 22: Grammar and Punctuation exam. ... Have a stupendous summer! Thank you for a great school year! Tuesday, May 20: Grammar and Punctuation reviews C & D (see documents, "Practice: Crop Circles" & "Grammar Review 2014"). Friday, May 16: Calendar reminder: Tuesday: review. Thursday: Grammar and Punctuation Test. Today: Grammar and Punctuation Review B (see documents). Thursday, May 15: Calendar reminder: Grammar and Punctuation Packet due tomorrow. Study Hall---AP World History exam. Wednesday, May 14: Extra credit due. 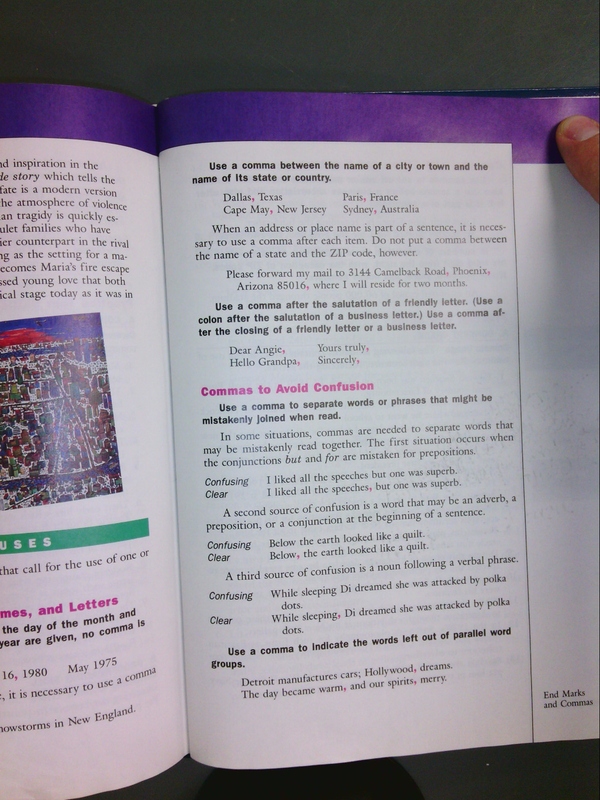 Reminder: Grammar and Punctuation Packet due Friday. Finalize Poster Sessions. Tuesday, May 13: Calendar: Extra credit (optional) due tomorrow; Grammar and Punctuation Packet due Friday---note: this is a calendar change. Resume Independent Study Poster Sessions. Friday, May 9: Resume Independent Study Poster Sessions. Thursday, May 8: Resume Independent Study Poster Sessions. Wednesday, May 7: Resume Independent Study Poster Sessions. Tuesday, May 6: Begin Independent Study Poster Sessions! 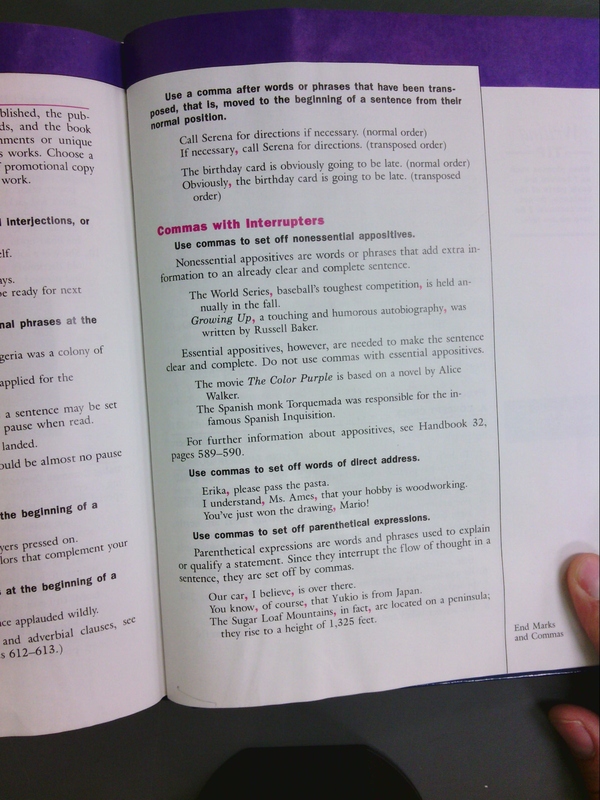 Calendar: Grammar and Punctuation Packet (#1-14) due approximately Wed. 14; extra credit due the same day. 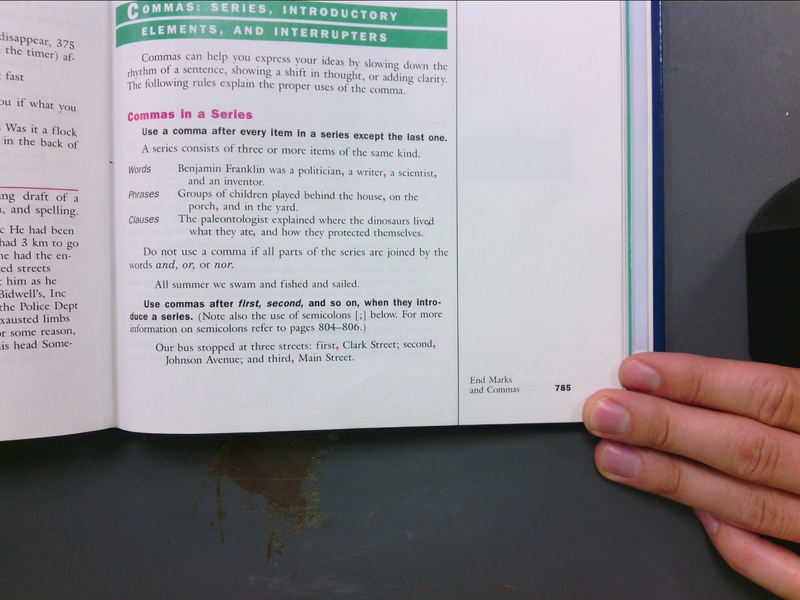 Friday, May 2: Debrief Punctuation and Grammar Review A (#11). Assigned: Quotation Marks, Apostrophe, and Parentheses (#12-14; see documents). 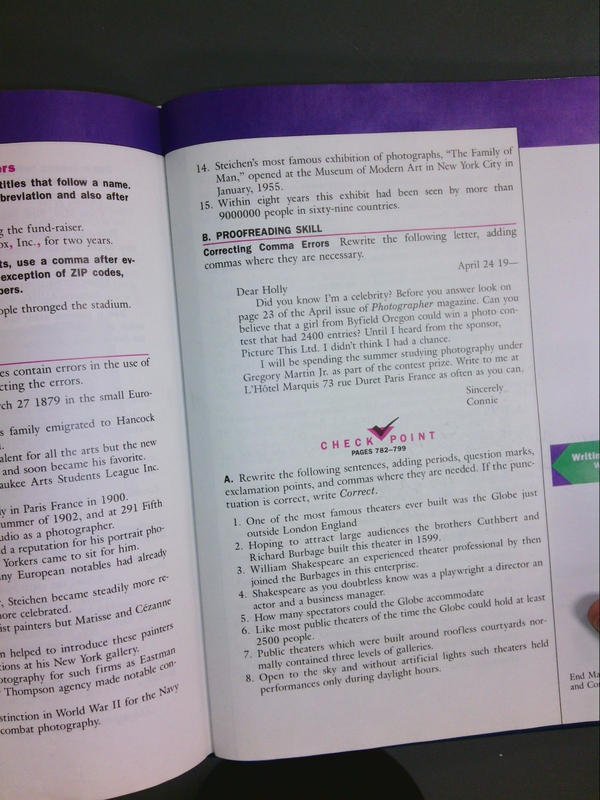 Note: the grammar and punctuation assignments, #1-14, are due after the Poster Sessions (approximately Wed., May 14). Any unfinished assignments are now homework. So, #5-10 and 12-14 are now on the website. I apologize that some of the files are inverted; after opening the file, go to "View" then "Rotate Clockwise," which you have to do twice. Thursday, May 1: Notice: Tuesday we begin the ISP Poster Sessions. Late passes are not accepted for this assignment. Come prepared with your poster, your final draft, the whole writing process, and a typed statement of revision that addresses the comments on the rubric. Today: MLA revisited (see documents). Resume grammar and punctuation work: (#11: the clause work of Review A will be due tomorrow). 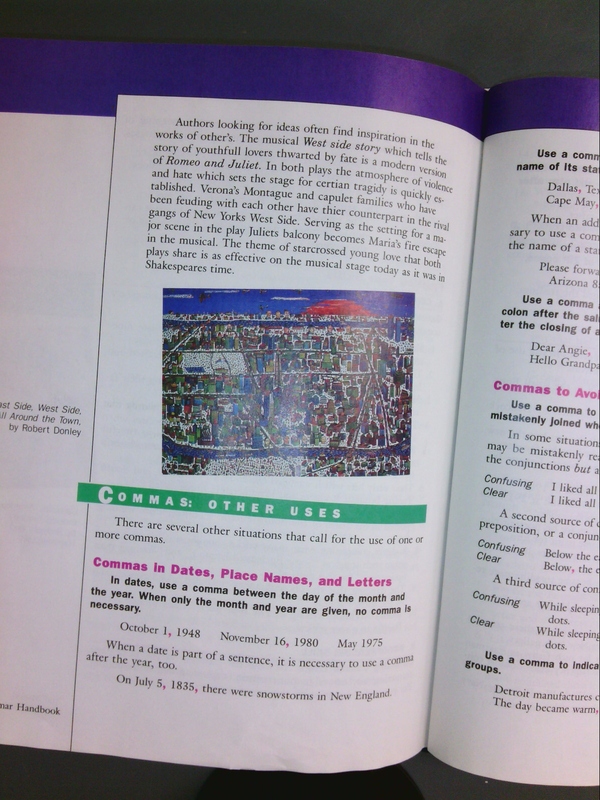 Wednesday, April 30: Debrief comma work (#5e). Punctuation and Grammar Review A (#11; see Mr. Nelson). Friday, April 25: Resume grammar and punctuation work: commas, colons, and semicolons (see Mr. Nelson). Reminder: Typed revised in-class essay due Tuesday. Thursday, April 24: Resume journal sharing. Three Literature Circle journals due. Wednesday, April 23: Literature Circle journal sharing. Tuesday, April 22: Calendar: Literature Circles Journals due tomorrow; revised timed essay due Tuesday (typed, process attached). Instructions for revising timed essay (see documents). Independent Study Project (ISP) Poster Session Instructions (see documents; see Nelson or classroom buddy for your due date). ISP draft due; peer critique. Thursday, April 17: Period Four: In-class essay. If you miss this, plan to write the essay during conference period next week. Wednesday, April 16: Calendar reminders: Period 6: because we will be attending the honors assembly tomorrow, you should write the in-class essay during conference period next week, preferably Tuesday. ISP written work due Tuesday. 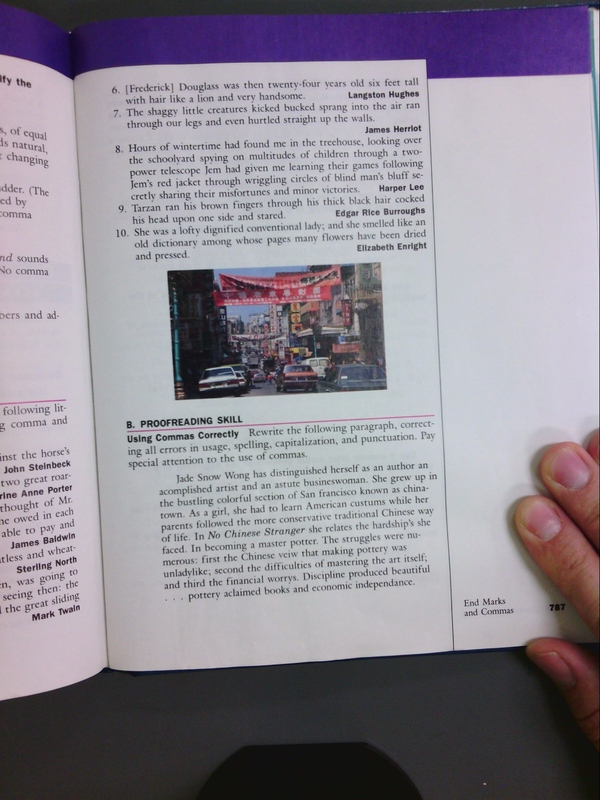 Review MLA Style Sheet (see documents). Tuesday, April 15: Calendar reminders: Thursday: "Then & Now" (extra credit) due; come prepared to write about your literature circle novel. Tuesday: ISP written work due. Literature Circle Meeting Three (see documents). Friday, April 11: Notice: Mandatory AP Info Session in the auditorium on Monday, April 14, during conference period. 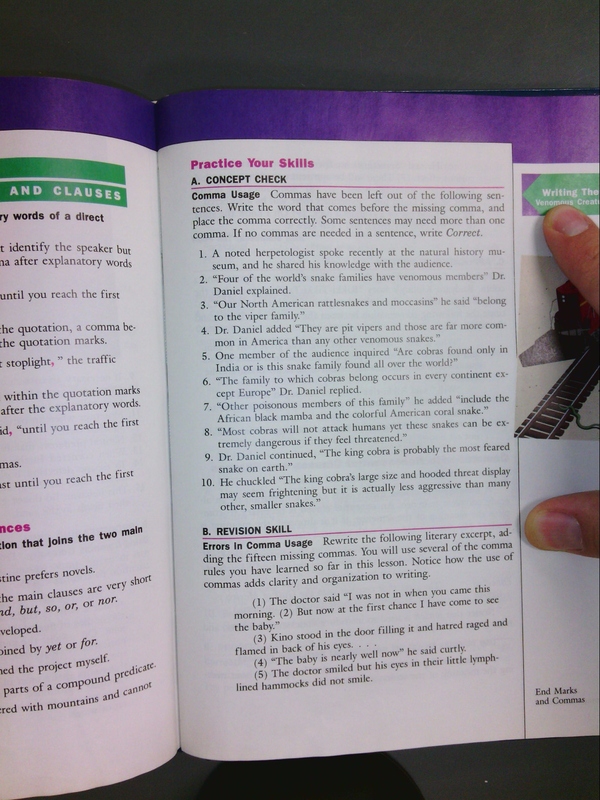 Resume grammar and punctuation work: debrief noun clauses; work on the comma (see Mr. Nelson). Wednesday, April 9: Notice: Mandatory AP Info Session in the auditorium on Monday, April 14. Literature Circles Meeting Two continued (see documents and classroom buddy). Tuesday, April 8: Literature Circles Meeting Two (see documents and classroom buddy). Monday, April 7: Calendar reminders: Tomorrow: AIMS Math test at 7:40 a.m. in the cafeteria; Literature Circle Meeting Two. Extra credit option associate with Literature Circles: "Then & Now": in one typed page with a works cited, contrast the social or political circumstance in your novel with that country's contemporary circumstance; for example: http://www.nytimes.com/interactive/2014/04/06/magazine/06-pieter-hugo-rwanda-portraits.html?ref=magazine&_r=3. Today: resume grammar work: clauses. 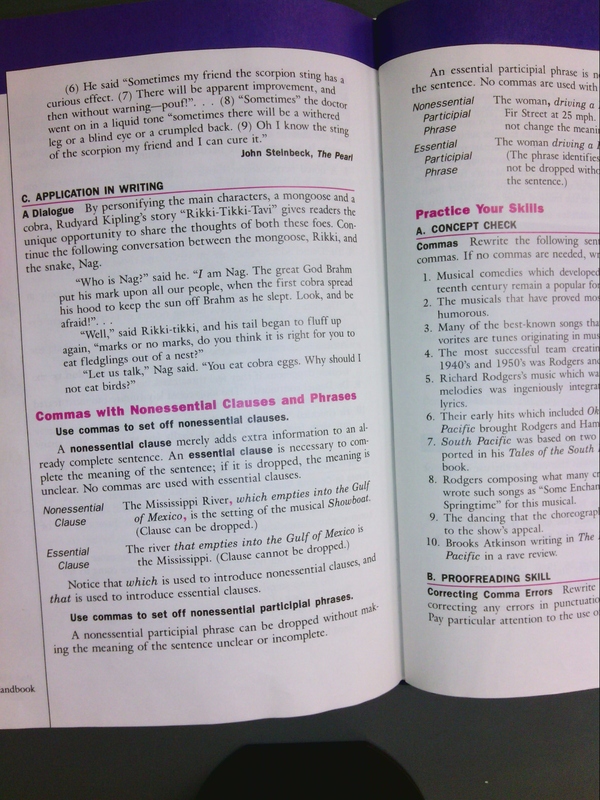 Friday, April 4: Resume grammar work: Types of Clauses, guided note-taking (see Mr. Nelson); complements and clauses. 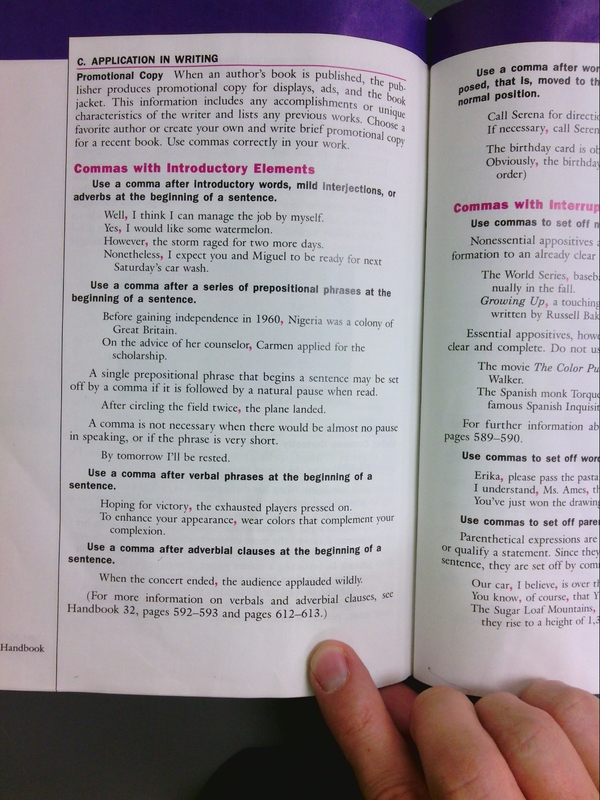 Thursday, April 3: Resume grammar work: complements (see Mr. Nelson). Wednesday, April 2: Debrief ISP reports (see documents). First draft of written work due Tuesday, April 22--typed, include process. Resume grammar work. Tuesday, April 1: Literature Circles Meeting One (see documents); due at the end of class: (1) reading and discussion notes, (2) questions, (3) analysis, and (4) journal prompt. Friday, March 28: Reminder: on Tuesday, you'll have your first literature circle meeting; bring notes, three discussion questions, and two journal prompts. 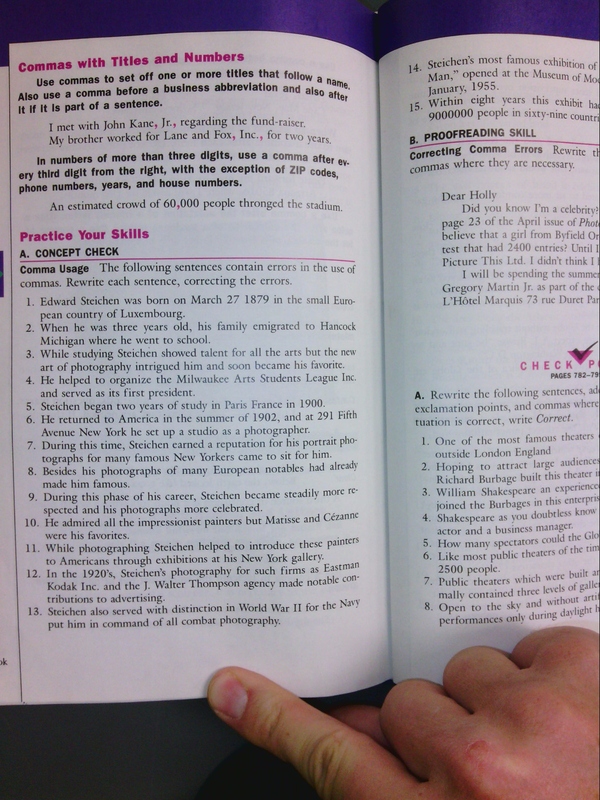 Resume grammar work: Subjects and Predicates; begin Complements (#3; see Mr. Nelson). Thursday, March 27: ISP reports due. 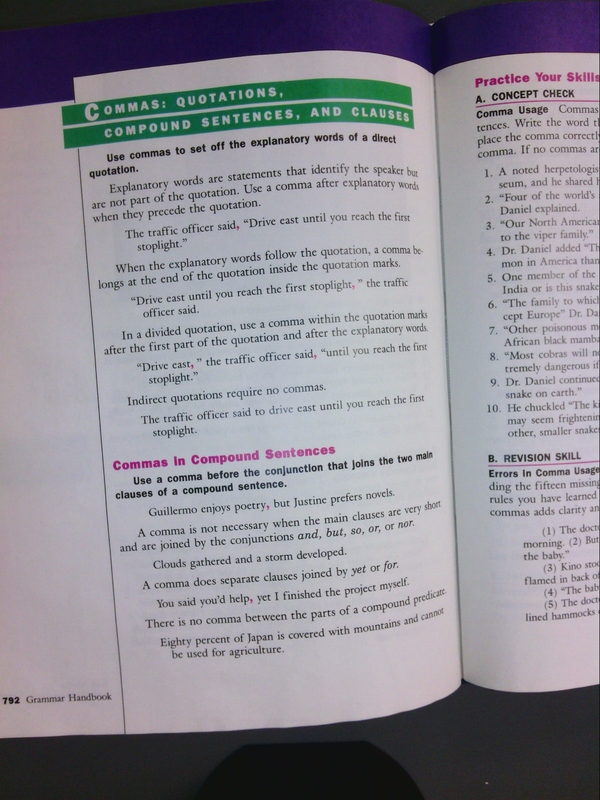 Begin grammar and punctuation work: Parts of a Sentence (#1; see documents and classroom buddy). 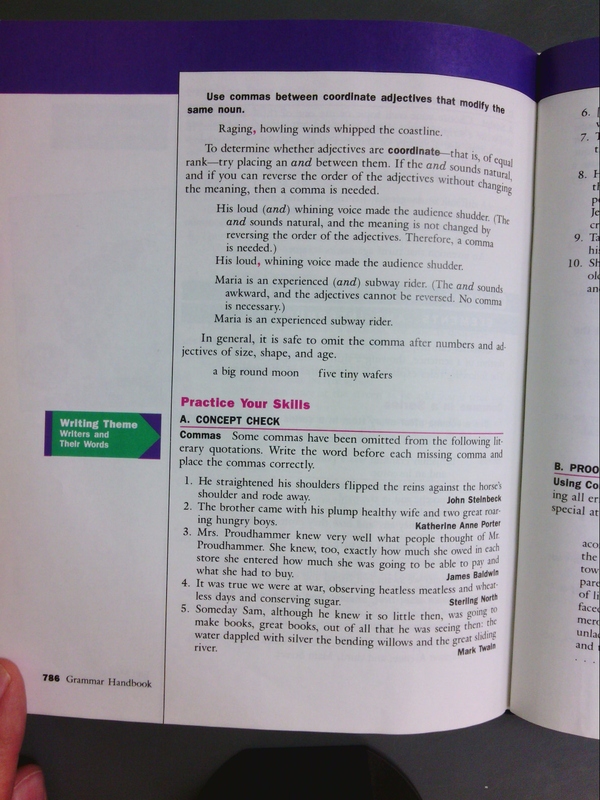 Subjects and Predicates (#2)--to be continued tomorrow. Wednesday, March 26: Calendar reminder: ISP reports due tomorrow. Time to read and write for ISP or Literature Circles. Tuesday, March 25: Calendar reminders: Thursday: ISP reports due (typed); include any drafts of written work. Begin Literature Circles: overview, group and novel selection (see documents). Thursday, March 13: Poetry Reading (journal sharing). Wednesday, March 12: Time to work on Independent Study Project. Tuesday, March 11: Poetry Test. Reminder: tomorrow you will have the hour to work on your Independent Study Project. Monday, March 10: Calendar: Poetry test tomorrow; bring your annotated packet. Tuesday and Wednesday: come prepared to work on Independent Study Project. Extra credit this week: CA Conrad at the Poetry Center: discussion Tuesday at 6:00; reading Thursday at 7:00. This weekend: The Tucson Festival of Books! (see extra credit page). Resume the Poetry Analysis Presentations. Friday, March 7: Packet due: #1-8 and Journals 1-3: (1) Introductory Reflection, (2) The Image, (3) Childhood Poems Analysis, (4) Allusion: Pinsky, (5) Two Poets, a comparision (video), (6) Sonic Elements, (7) Metaphor, (8) Tone: Identity. 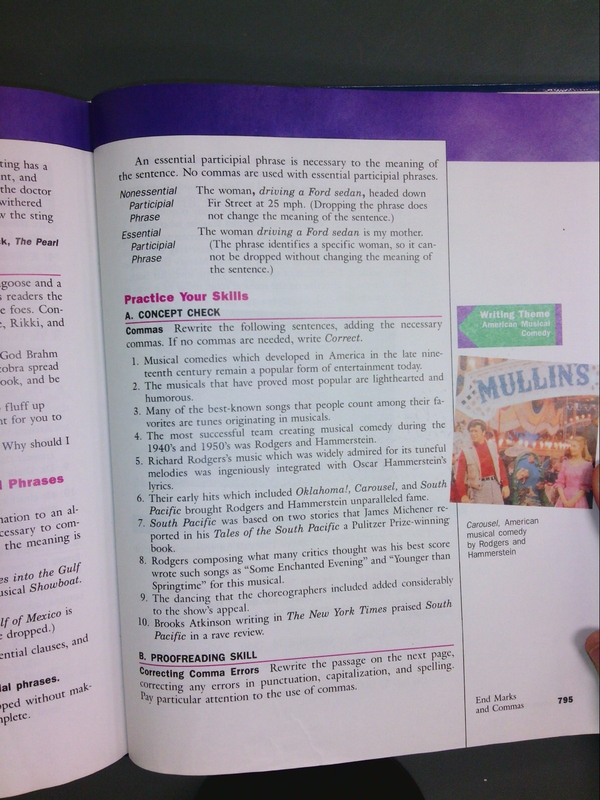 ISP Book and Progress Reports due Thursday, March 27 (see documents). Poetry Test on Tuesday. Continue Poetry Analysis Presentations. Thursday, March 6: Reminder: Packet due tomorrow: #1-8 and Journals 1-3. Begin Poetry Analysis Presentations (which is the review for Poetry Test). Wednesday, March 5: Reminder: Packet due Friday: 1-8 and Journals 1-3. Resume preparation for the Poetry Analysis Presentations, which begin Thursday. Tuesday, March 4: Calendar: Thursday: Extra credit at the Poetry Center, 7:00 p.m.: Corin and Steinberg prose reading. Friday: Packet due: 1-8 and Journals 1-3. Friday: AP fees due. Saturday: Spring campus clean-up and Poetry Out Loud Regional Finals (1:00 p.m. at the Poetry Center). Return Siddhartha essays and debrief. Begin Poetry Analysis Presentation preparation (see Mr. Nelson). Begin presentations Thursday. Friday, February 28: Finalize Tone and Identity (#8); 15 minutes to work, then class discussion. Thursday, February 27: Resume Tone and Identity (#8); note: you'll have 15 minutes to finish this project in class tomorrow. Wednesday, February 26: Tone and Identity (#8): practice with Mr. Nelson's guidance: Francisco X. Alarcon's "The X in My Name" (see documents). Tomorrow: continue in small groups. Tuesday, February 25: AIMS reading test. Monday, February 24: Calendar reminders: March 27: ISP book and progress reports due; be working on Journals 1, 2, & 3. Debrief packet entry #7. Time to work on journals. 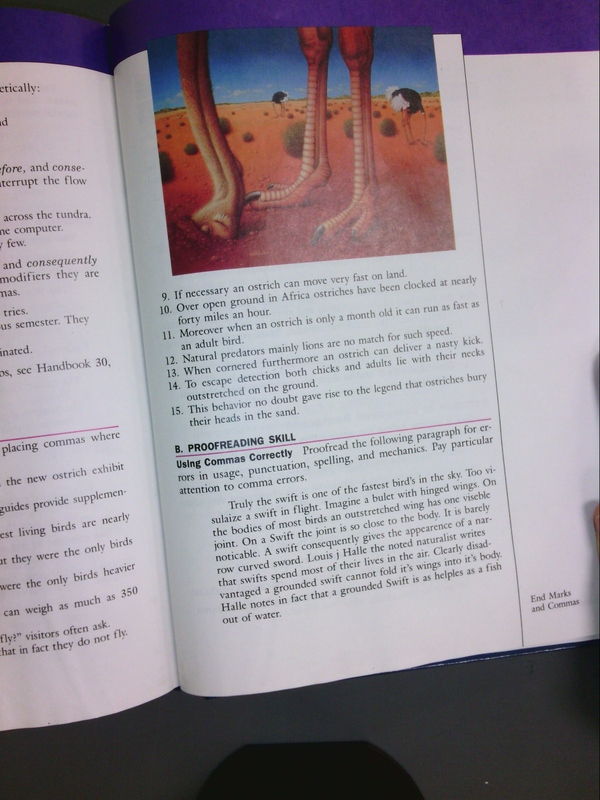 Wednesday, February 19: AIMS review. Tuesday, February 18: Resume Monday's analysis. Journal #3: Extended or Controlling Metaphor Poem (see documents). Monday, February 17: Metaphor: "Bluebird" by Charles Bukowski and "Tourist Death" by Archibald MacLeish (#7; see documents). Friday, February 14: Calendar reminder: next two weeks are sequential. Resume Sonic Elements (#6; see documents). Journal #2: The Sonic Poem: Write a poem that emphasizes the musical qualities of language: rhyme (in any of its manifestations), assonance, alliteration, refrain, etc. And in so doing, employ lineation deliberately; that is to say, use at least one constraining principle to determine the lengths of the line: rhyme scheme, syllabics, and/or number of stresses. Thursday, February 13: Introduction to Sonic Elements of Poetry. Resume lesson tomorrow. Wednesday, February 12: Video: Contrast the styles of two poets: Carolyn Forche and Mei-Mei Berssenbrugge (#5; see Mr. Nelson). Tuesday, February 11: Calendar reminders: AP Registration due Monday, Feb. 17; Parent-teacher conferences tomorrow, 4:30-7:00. Debrief Childhood Poem Analysis (#3). Resume Allusion: Two Poems by Robert Pinsky (#4). Friday, February 7: Calendar reminders: Monday at 7:00 p.m.: extra credit at the Poetry Center: Aisha Sloan and Ariana Zwartjes. Begin discussion of two allusive poems by Robery Pinsky (#4); in-class time will be give on Tuesday. For Monday, come prepared to debrief on #3. Thursday, February 6: Resume Childhood Poems Analysis (#3; see multiple documents). Wednesday, February 5: Childhood Poems Analysis (#3; see multiple documents), to be continued in class on Thursday. Tuesday, February 4: Calendar: Monday at 7:00 at the Poetry Center: Zwartjes and Sloan. Debrief ISP Contracts; next deadline: Thurs., March 27 (information forthcoming). Due: Siddhartha essay. Return books. Poetry Glossary (see documents or classroom buddy). The Image (packet entry #2; see documents [two files]). Friday, January 31: Journal sharing. Introductory Poetry Reflection (#1; see documents). Thursday, January 30: Contract (Phase II) due. (Period 4) Siddhartha packets due. PSAT follow up. Wednesday, January 29: Calendar reminders: Contract (Phase II) due tomorrow; typed and revised essay due Tuesday. Journal sharing. Siddhartha packets due. Tuesday, January 28: Packets due next time we meet. Journal sharing. Timed essay revisited: thesis statements and direct quotation (see documents). Peer input on essay. Revised essay due Tuesday (see documents for instructions). Friday, January 24: In-class timed essay (see Mr. Nelson). Siddhartha packet due Tuesday. Wednesday, January 22: Calendar: Journals 1 & 2 due Thursday; in-class essay on Friday. Return and debrief Independent Study Contracts. Phase Two of contract--sources, genre, and pages--due Thurs., Jan. 30. Resume discussion of Siddhartha. Tuesday, January 21: Calendar: Journals 1 & 2 due Thursday; in-class essay on Friday. Vocabulary Part Two due (#4). Quiz. Discuss Siddhartha. Friday, January 17: Calendar: finish reading Siddhartha for Tuesday; vocabulary due then as well. Time to read, write journals, or work on vocabulary. Thursday, January 16: Calendar: finish reading Siddhartha for Tuesday. Reading quiz and discussion of Siddhartha. Tuesday, January 14: AP registration materials (see Mr. Nelson). Calendar reminder: read through page 85/69 for Thursday. Independent Study Project contract due (subject and research question). Siddhartha quiz. Discuss part one of Siddhartha. Friday, January 10: Calendar reminder:ISP specific subject and research question due Tues.; Siddhartha, to page 42/34 due Tues. Practice writing specific subjects and research questions (see documents). Thursday, January 9: Calendar reminder: ISP specific subject and research question due Tues. Siddhartha overview and calendar (see documents). Book check-out and time to read. Wednesday, January 8: Introduction to Buddhism (#2; see Mr. Nelson and documents), in preface to reading Hermann Hesse's Siddhartha. Tuesday, January 7: Welcome back and happy new year! Introduction to Independent Study Project (see documents; research subject and guiding question due Tuesday, January 14). Poems in preface to Hermann Hesse's Siddhartha (#1; see documents).